Neck pain is a serious concern within the pilot and flight engineer community. 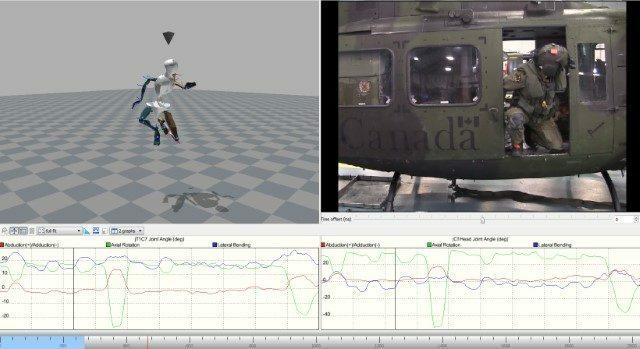 HSI® has taken part in research focused specifically on characterizing the typical neck loads experienced by CH-146 Griffon aircrew within the Royal Canadian Air Force – identifying and prioritizing potential mitigating strategies, and evaluating the benefits of implementing those strategies. Given the complex operating environment of Griffon aircrew, collecting data while in flight is not easy. Therefore, HSI®’s research has taken Griffon aircrew into the modeling and simulation world. Step 1 was to interview aircrew about exemplar missions, tasks that comprise those missions, and the individual body movements that occur during each task. Step 2 was to calculate the loads on the neck during each mission task. This was done by using motion capture technology to create digital files of aircrew completing the mission tasks and then feeding those files into modeling software to calculate neck loads. Essentially, this provides researchers with a simulation of Griffon aircrew completing tasks, which can be a very powerful tool when investigating potential mitigating strategies to reduce aircrew neck pain. To learn more about how modeling and simulation technology and research can help your organization, reach out to us! Email HSI® Senior Consultant Jordan Bray-Miners at jbrayminers@humansys.com.